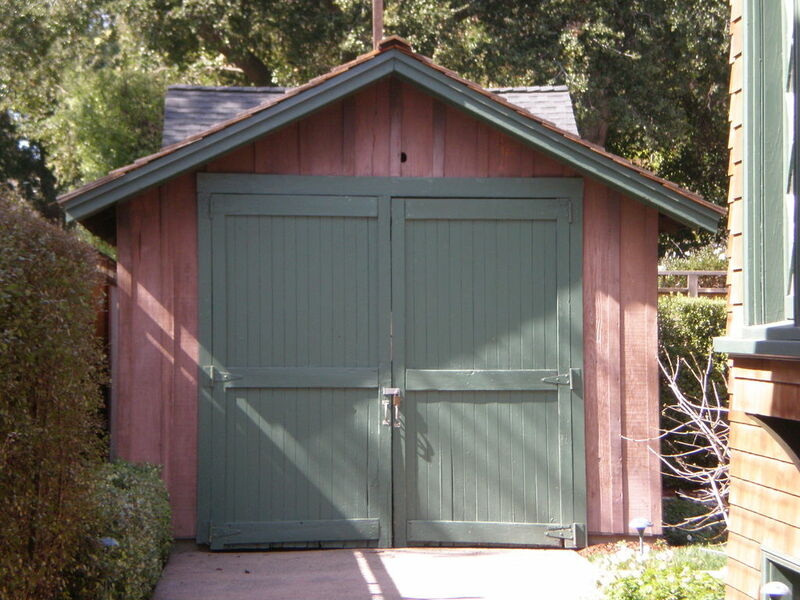 The biggest names in the technology world generally had humble beginnings – many were started in garages or basements and gradually grew into the powerhouses we know today. But with technology now one of the largest business sectors, how can the demands of finding or building ‘homes’ for fast-paced technology companies be married with the sometimes glacial pace of architectural practice and construction? Whether a company is building a bespoke HQ, leasing an existing building or repurposing a different structure entirely, the only constant remains the growing need to find a way in which the speed of property provision can match the speed of the technology industry as a whole. In a boom-and-bust industry, as technology has tended to be, matching supply with demand can be a tricky task. It’s an ever-evolving question that companies are finding their way around. Much of Silicon Valley is enjoying a technological boom right now but just a few short years back, it was looking pretty touch-and-go for some of the Valley’s prime real-estate. Smaller, more agile companies and startups are looking to exploit cheap rent in fringe neighborhoods while others are building enterprise palaces to reflect their global power. What follows is a look at the various methods and notable examples of tech’s speculative castles, massive office blocks that narrowly avoided permanent abandonment, cleverly repurposed buildings and some historic monuments that in one way or another, helped us along to where we are technologically today. We’ve split this over a few pages to make it easier to read, but if you’d prefer to view it on one page, you can do that too. Despite the fact that technology moves at a mighty pace, the very biggest companies still want a modern day ‘castle’ as their headquarters; a physical epicenter of operations that acts as a metaphorical statement for the world. A ‘we’re here and we’re not going anywhere’ played out in concrete and curves. Apple’s upcoming ‘Spaceship’ Campus 2 development is one highly-visible (in every sense) case in point. 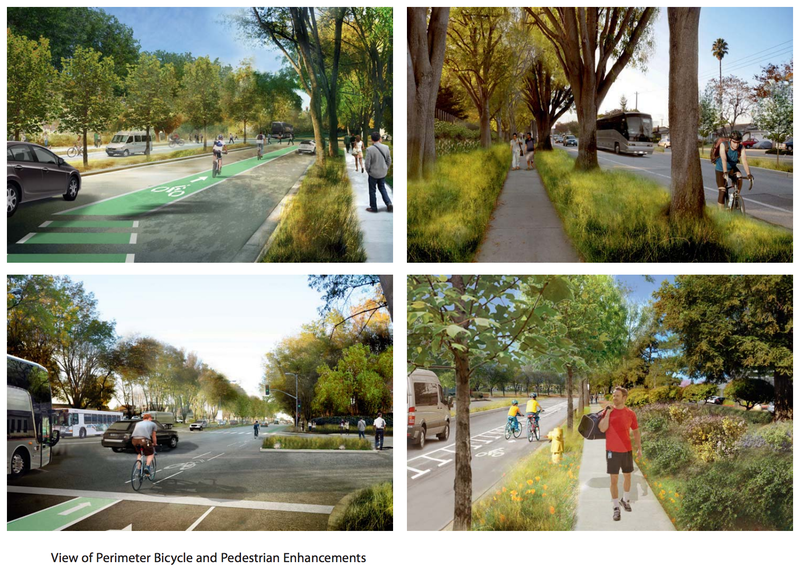 First proposed at a Cupertino City Council meeting by Steve Jobs back in 2011 (below) and now looking likely to open its doors in 2016 following some short delays, the 2.8 million square-foot campus will serve as Apple’s newest headquarters and will provide a new circular office, an R&D building, a 1,000 seat auditorium, a fitness center, a central plant, parking and a separate 300,000 square-foot research facility. There are also plans for it to attempt to generate its own electricity on-site in a bid to be less of a drain on local power resources. This aside, all the power it draws will be from 100 percent renewable sources and while its aim might be to maximize efficiency and convenience for Apple employees, it’s not all R&D buildings; 80 percent of the site will be open space, and it will also play home to more than 7,000 trees. There will even be 300 electric vehicle charging stations and a raft of eco-friendly transport options to get employees to work. Clearly, as a company that prides itself on design principles laid down by its iconic co-founder Steve Jobs, the company wanted Foster and Partners’ architectural creation to reflect that. When it is finally complete, there will be around 12,000 employees filling the campus. Google confirmed that it would be moving its UK headquarters in the capital to a new site in Kings Cross in central London back in January last year. What followed was high-profile news of how it would include a rooftop pool and athletics track in its 1 million square feet of space, however, that wasn’t to be and the existing designs were shelved for the time being. As part of a new development called Kings Cross Central, Google’s offices will occupy just 2.4 acres of the mixed use 67 acre site just behind Central Saint Martin’s – University of the Arts London, no doubt a potential source of future design talent right on the doorstep. 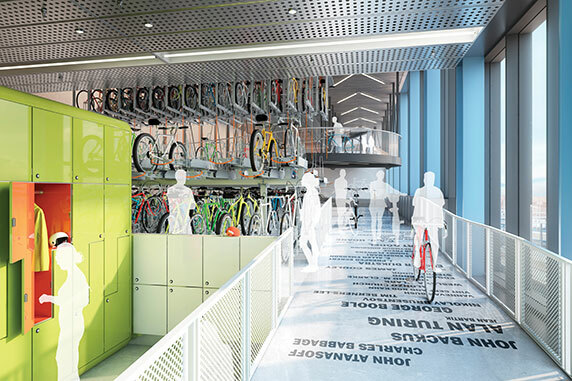 Exactly what the new building will be like is yet to be seen, but Google said at the time that it remained committed to the project in the long-term, if not the formerly proposed design. 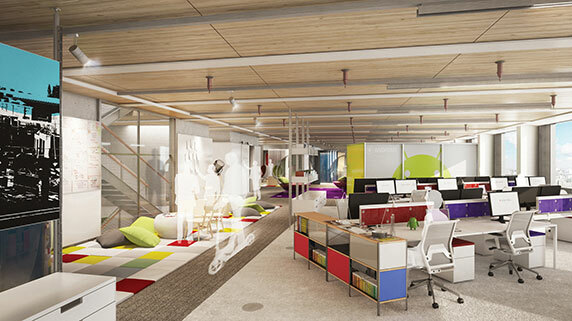 Unfortunately, a fresh design could take up to two years, according to the architectural news site bdonline. Interestingly, the reason behind the change of heart is a review of its global properties to ensure they’re all aligned philosophically, which is sort of the opposite of the agile (software) development we’ve come to expect from the company. It can’t all be shiny new hi-tech palaces though, and with a financial crisis in our recent past, there was certainly a period when custom-built offices intended to be filled with the brightest minds in tech lay dormant for years on end. That was certainly the case for a number of developments in Silicon Valley a few years ago. 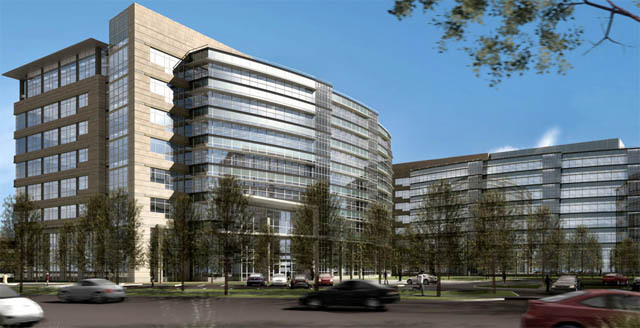 The Riverpark Tower II development in San Jose, for example, was built as a speculative home for future technology companies and completed in 2009, some 20 years after its foundations had first been laid and abandoned amid another real-estate crisis. 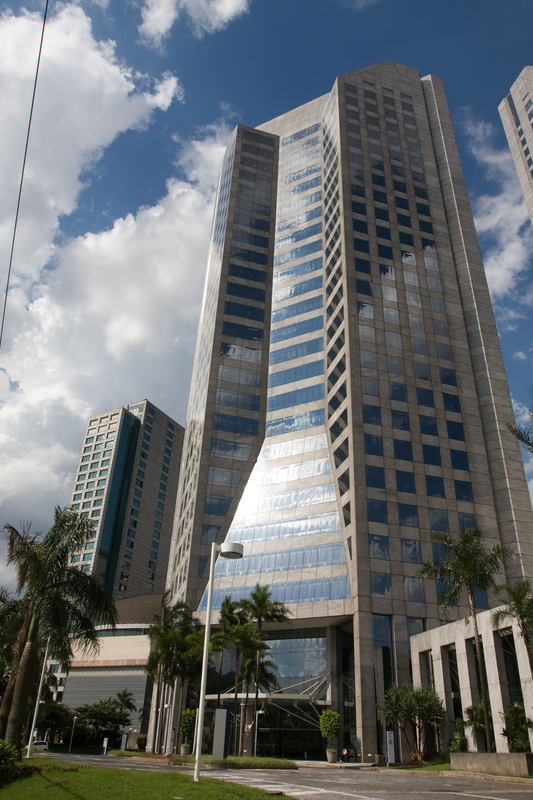 Unfortunately, due to the financial crisis, the 16-storey, 318,000 square-foot office tower lay empty for more than four years, resulting in a $44.1 million loan default. After holding out for full-building users, the landlords have relented and are now allowing floor occupancy, as a result, this year Intacct has agreed to rent about 60,000 square-feet of space. 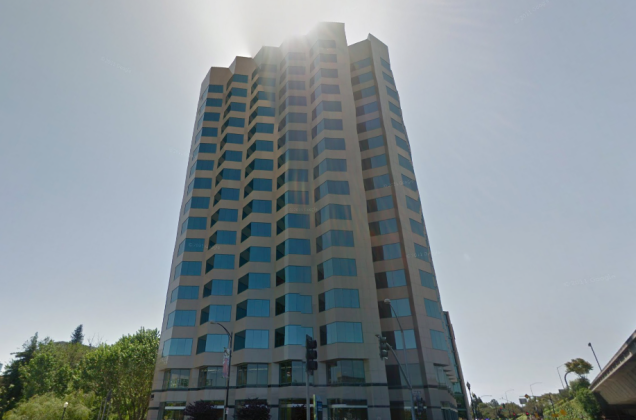 It’s a similar story for Moffett Towers, a collection of seven eight-storey buildings in Sunnyvale offering 1.7 million square-feet of office and R&D space. First going on the market in 2008, just in time for a financial collapse, the buildings sat mostly empty until 2011 when a flurry of activity saw Motorola, HP, Microsoft and a number of other companies finally take up space in the buildings in quick succession. These two are by no means the only tech headquarters that have seen temporary abandonment at some point in their past. BAE Systems‘ former headquarters lay dormant for three years until Cavium filled one of the buildings in 2011 and signed an eight-year deal for the second at the end of last year. 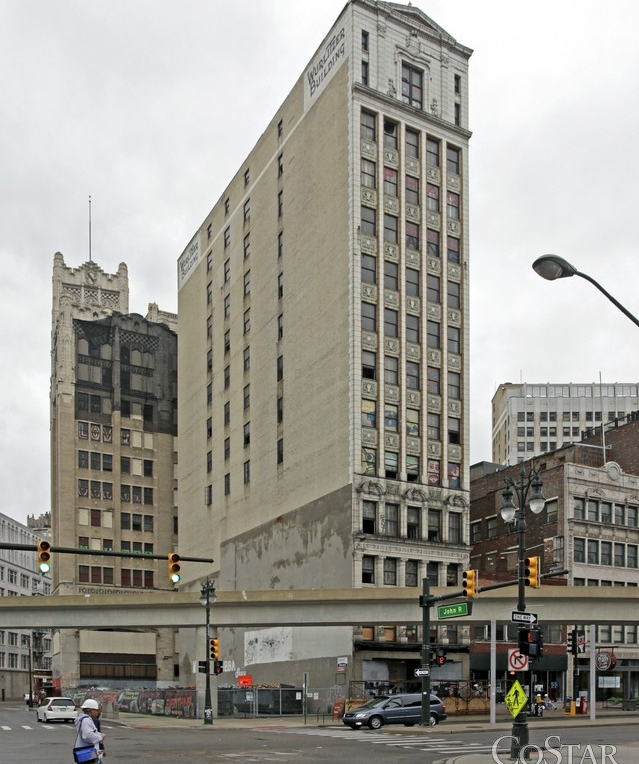 Perhaps one of the most notable ‘tech’ headquarters is the dominating Wurlitzer building in Detroit. While not current ‘tech’ in today’s terms, Wurlitzer was once considered ahead of its time and at the intersection of technology and entertainment. Finished in 1926, the 14-storey building underwent several expansions and renovations over the years, as noted by DetroitUrbex. 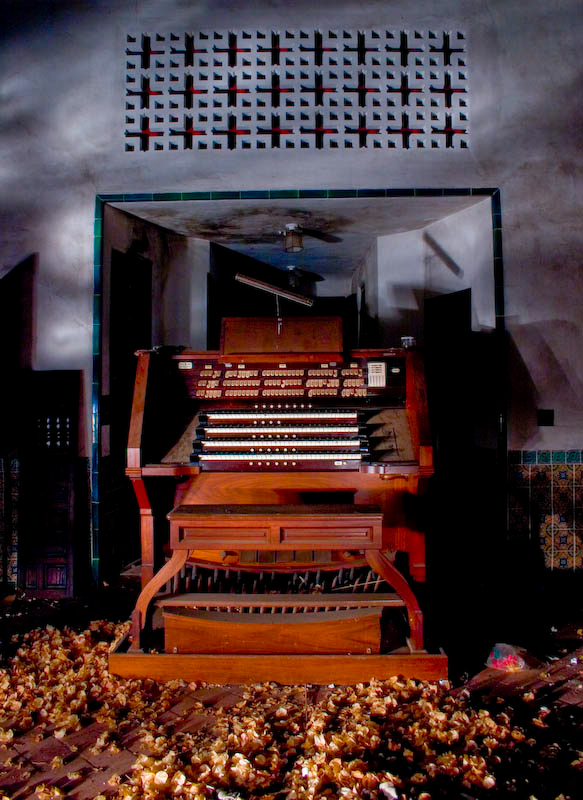 Wurlitzer finally vacated in the 1970s and the building closed its doors in 1982. Since then its has, on more than one occasion, hurled its decaying bricks at the street below, causing some concern for the local neighbors. While it did look like the building’s vacancy streak could come to an end, it seems the would-be buyers got cold feet earlier this year and backed out. It remains empty. Obviously, not all tech companies find a home in custom-built office space, but some are going further than others in the imagination department. And let us not forget that part of the reason San Francisco’s tech scene flourished where it did is because it was the base for other tech research – in this case military blimps, and when they moved out, the aerospace industry. 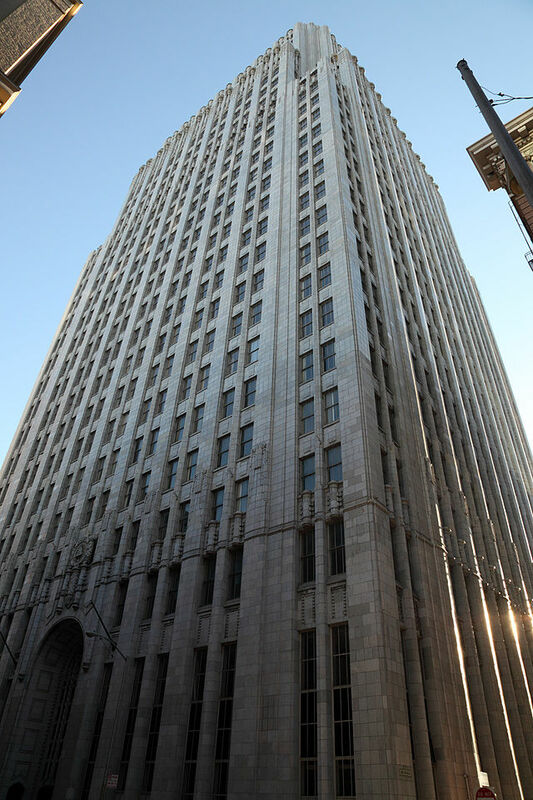 So, perhaps all hope for the Wurlitzer building isn’t lost if the Pacific Bell Telephone and Telegraph building (referred to as the ‘PacBell building’ or simply ‘140 New Montgomery”) in San Francisco is anything to go by. Conceived in 1923 as a $2 million, 20-storey office building for Pacific Bell, it was completed in 1925 at a cost of more than double that – and with six extra floors. Following the break-up of the Pacific Bell Telephone and Telegraph Exchange in the 1980s, the building eventually fell dormant in 2005. It was then snapped up in 2007 by Wilson Meany for $118 million with the intention of turning it into luxury condos. However, following the financial crisis, the developer instead decided to fit it out with hi-speed fibre and go in search of tech tenants, which it successfully managed to attract in the form of Yelp (and others) last year, thereby returning the building to its technological roots. 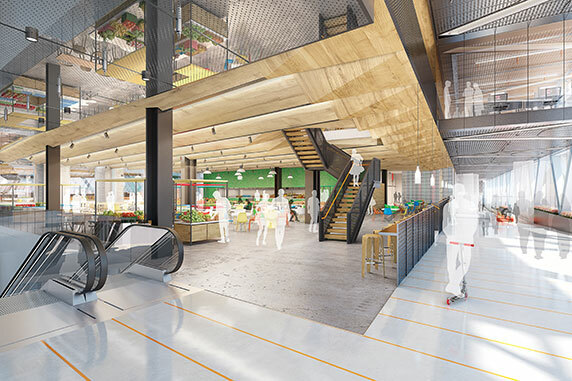 Rackspace has a different approach to architectural recycling and is now showing a trend of taking abandoned malls and turning them into sparkling, fully-functioning office spaces, replete with the now somewhat cliched corporate slide. At least, the current ‘Rackspace Castle‘ in San Antonio, Texas has one. Now, it has agreed to take on another former mall, this time a 194,000-foot affair that will reportedly provide working space for 570 relocated ‘Rackers’. There’s no confirmation of a slide as yet. Naturally, London’s Tech City area in Shoreditch is another prime example of an industry converting warehouses and tenements into offices for trendy startups and established tech companies alike, although that’s led to its own problems in London, gradually pushing rents beyond the reach of many fledgling companies. 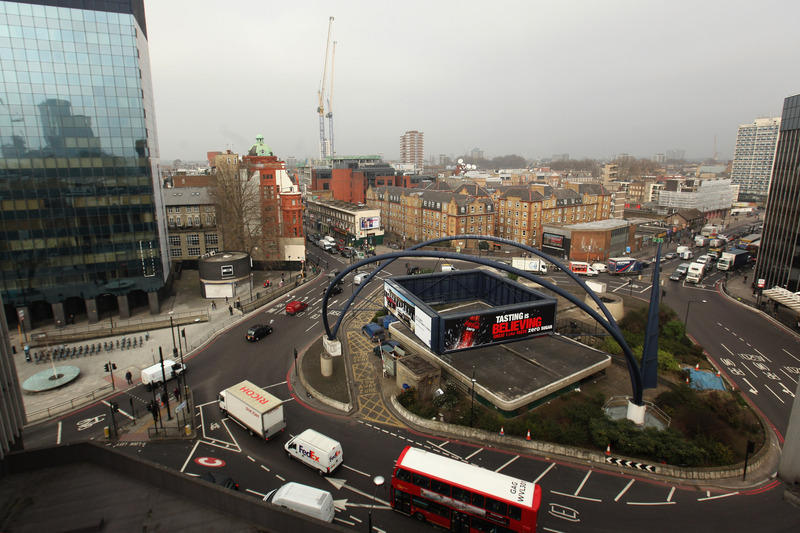 Old Street roundabout, the iconic center, if not actual center of ‘Tech City’ in London. Image via Getty Images. While buildings like the HP garage where Bill Hewlett and Dave Packard first established Hewlett-Packard back in 1939 could be considered an abandoned HQ in some sense, it seems much more like a monument to the company’s history. Most recently, in 2005, the buildings at 367 Addison Avenue, Palo Alto were restored by HP back to their original 1930s state; the company purchased the property in 2000 but didn’t announce its plans until 2004. Although not open to the public, if you happen to be passing by you’re apparently welcome to snap away from the sidewalk. 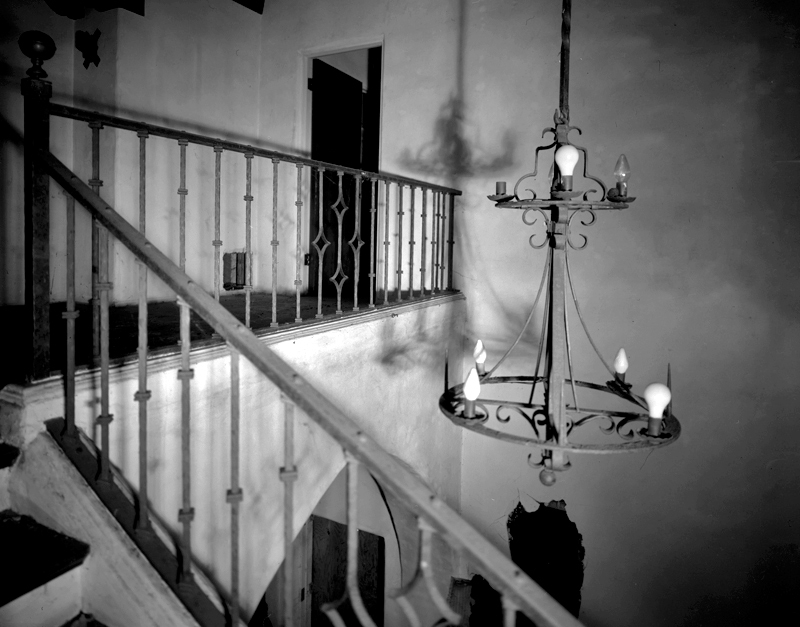 In 2007, it was added to the US National Register of Historic Places. 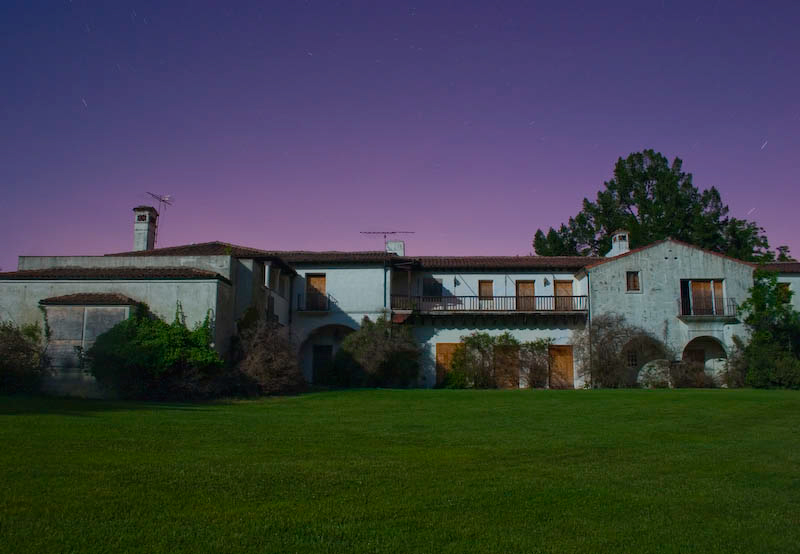 One place you’re too late to get a peek at, however, is the late Steve Jobs’ abandoned Jacklin Mansion. Originally built in the 1920s, the mansion had 14 bedrooms and occupied 18,000-square feet for Daniel Jackson, a man noted for advancing the copper refining process and ‘wiring america’, so not totally unrelated to technology either. Jobs snapped up the mansion in 1984, lived in it for about a decade and then moved on. 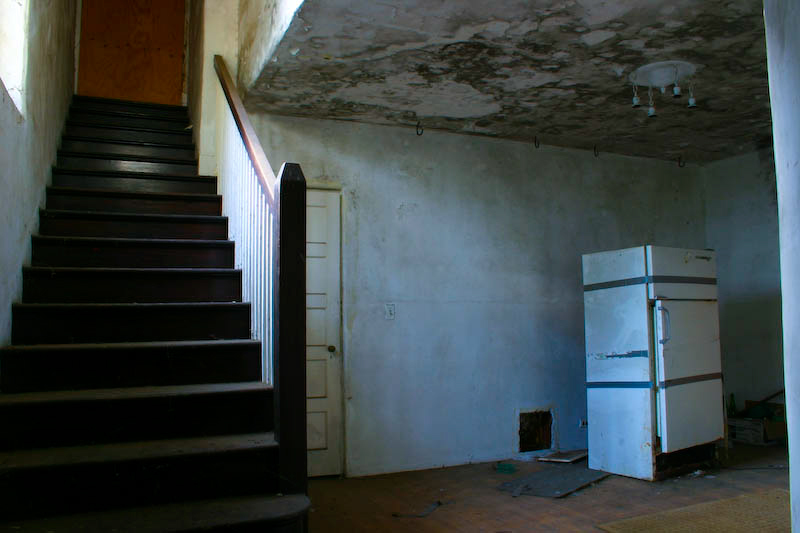 In the following years it was rented out but eventually fell empty (and ultimately into disrepair) in around 2000. In 2004, Jobs filed for permission to demolish it and build another more modest home on the site. Unfortunately for him a grassroots preservation group objected to the demolition and what ensued was a long-running, back-and-forth legal battle which resulted, as tended to be the way, with Jobs getting what he wanted. Clearly, ‘Starchitect’ Rem Koolhaus’ thoughts on preservation weren’t front-of-mind when he was planning the destruction. The building was eventually torn down shortly before Jobs’ death in 2011, some 7 years after permission had first been granted before preservationist intervention. With technology companies priding themselves on being resourceful and adaptive, there’s no doubt that startups and established businesses will continue to change the architectural landscape as we know it to meet its own needs – one shed, mansion, abandoned mall, office block or super-campus at a time.